An overview showing the drainage throughout the city. Archaeologists discovered that almost all the houses had a bathing and/or drainage system. 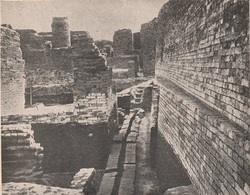 This suggested that the people of the Mohenjo-Daro city were quite skilled. The favorite color of the people of the Indus River Valley Civilization was red. Indus Valley homes had thick walls to keep people cool through the heat. Most Indus people did not live in cities. About 9 out of 10 people lived in small villages as farmers and traders. A large portion of every crop a framer grew, had to be paid into public granaries. The decline of this peaceful, organized civilization was rapid fast between 1900 and 1700 BCE. Although nothing is 100% certain, many believe it was a natural disaster. Some say it was a massive flood caused by a rivers change in course because there was very little left behind. This picture shows how they made use of every room including the roofs as one also. The families used the roofs of their houses as an extra room. On a hot night it gave them a cool place to sleep, gave them a place for storage, and children used it as an area to play on.